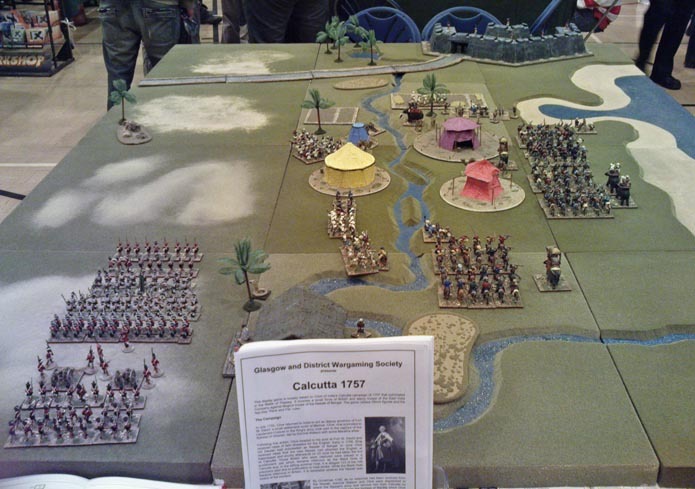 This display game is loosely based on Clive of India’s Calcutta campaign of 1757 that culminated in the Battle of Plassey. It involves a small force of British and sepoy troops of the East India Company against Moghul troops of the Nawab of Bengal. The game utilises 28mm figures and the fast play ‘Rank and File’ rules. In July 1755, Clive returned to India to act as deputy governor of Fort St. David, a small settlement south of Madras. Clive, now promoted to Lieutenant-Colonel in the King's army took part in the capture of the fortress of Gheriah, led by Admiral Watson with some Maratha allies. Following this action, Clive headed to his post at Fort St. David and received news of twin disasters for the English. Early in 1756, Siraj Ud Daulah had succeeded as Nawab of Bengal. In June Clive received news that the new Nawab had attacked the English at Kasimbazar and shortly afterwards on 20 June he had taken the fort at Calcutta. Those British who were captured were placed in a punishment cell which became infamous as the Black Hole of Calcutta and, in the stifling summer heat, it is alleged 123 of the 146 prisoners died due to suffocation or heat stroke. While the Black Hole became infamous in Britain, it is debatable whether the Nawab was aware of the incident. By Christmas 1756, as no response had been received from the Nawab, Admiral Watson and Clive were dispatched to attack the Nawab's army and remove him from Calcutta by force. Their first target was the fortress of Baj-Baj which Clive approached by land while Admiral Watson bombarded it from the sea. The fortress was quickly taken with minimal British casualties. Shortly afterwards, Calcutta itself was taken with similar ease. Approximately a month later, on 3 February 1757, Clive encountered the army of the Nawab itself. For two days, the army marched past Clive's camp to take up a position east of Calcutta. The Moghul strength was estimated at 40,000 cavalry, 60,000 infantry and thirty cannon. Even allowing for overestimation, this was considerably more than Clive's force of approximately 2,000 infantry, fourteen field guns and no cavalry. The British forces attacked on 5 February 1757 and after an initial assault during which around one tenth of the British attackers were killed, the Nawab sought to make terms with Clive and surrendered control of Calcutta. There are two main 28mm ranges that have been used for the Moghul army. 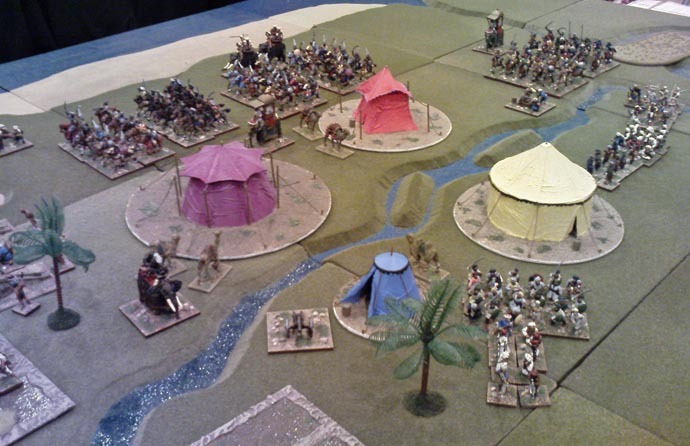 Bearsden Miniatures do a full Moghul range with every main troop type. These are supplemented with the Foundry India range that covers the whole Mughal period right up to the Indian Mutiny. They match together fairly well and for variety insert a few Ottoman and Persian heavy cavalry from other ranges. Central Asian light cavalry fought in India and these typical horse archers are readily available. 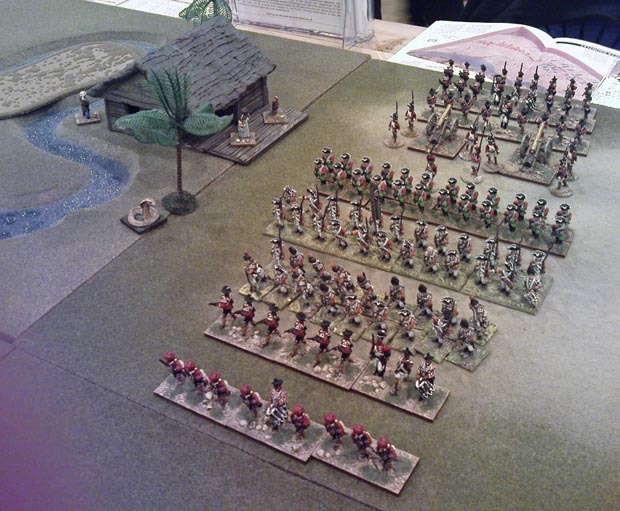 With a small conversion the Foundry Africa range provides a few infantry options. The Royal troops can be sourced from most Seven Years War ranges and the sepoys come mainly from Redoubt and 1st Corps. An excellent narrative history of the Mughuls is ‘The Mughal Throne’ by Abraham Eraly. For more on the army the must read title is ‘Mughal Warfare’ by Jos Gommans in the Routledge ‘Warfare and History’ series. For the fine detail, The Army of the Indian Moghuls by Wiliam Irvine (Delhi 1994) and last but not least Osprey MAA 263 Mughul India 1504-1761 by David Nicolle. Sadly out of print and not easy to find. 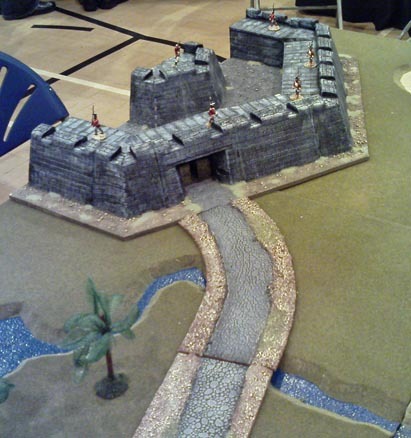 Osprey Fortress 51 Indian Castles is a great introduction to castles and siege warfare in India. A more detailed article on the early Moghul period and army lists for WAB appeared in Wargames Illustrated earlier this year. For this campaign that led to the more famous Battle of Plassey there is the Osprey Plassey 1757 by Peter Harrington and The Battle of Plassey by Michael Edwardes. For more on Clive there is Master of Bengal by Percival Spear.